I’ve visited Holy Trinity on occasions before, mainly just to sit in the churchyard, when needing a break from the crowded shopping streets. I’ve had a quick look inside before too, and found it very charming. But this time I visited with the intention of taking some photographs and looking at it all properly, and it spoke to me like places do sometimes, when you catch them at the right time of day. Certain churches make me ‘come over all T S Eliot’, as I think I’m going to refer to the way certain lines from that poet come into mind. Particularly Little Gidding, from Four Quartets. 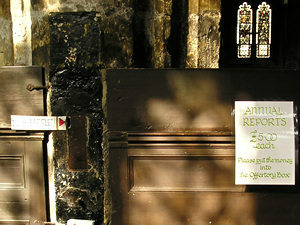 So here, ‘Now and in England’, a very special church, just off one of York’s busy shopping streets. 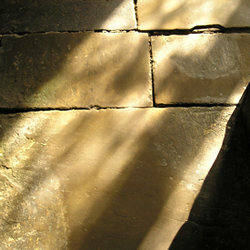 Late in the afternoon, the light falls through old windows onto worn stone floors. 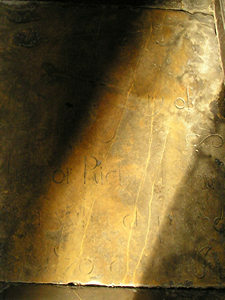 This stone glows, its surface smoothed by the centuries. All around the church are beautifully handwritten signs – discreet enough not to be intrusive – giving helpful information on the church’s features. The sign here publicises the Annual Report, on sale for £5. Trusting us not to steal it, the sign says ‘Please put the money into the Offertory Box’. As many of us might be standing there wondering what an offertory box looks like, slightly to the left, helpfully, next to an easy-to-miss slot in the wall, another handwritten sign says ‘IT’S HERE!’. 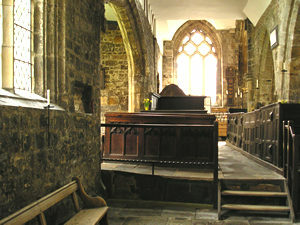 It’s a wonderfully wonky kind of place, with uneven floors and box pews all in a mad jumble. 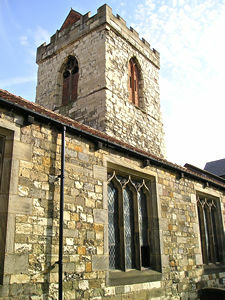 This was the only York church to escape major restoration in the Victorian period. Another useful handwritten sign highlights the piscina. For people like me who have only just begun to understand churches and their significant elements, these pointers are very useful. 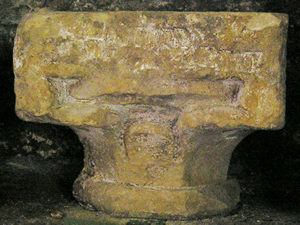 The piscina, the sign tells us, is "for washing the Sacred Vessels after Mass. 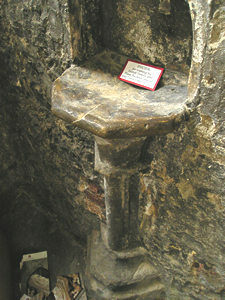 The drain delivers into Consecrated Ground." 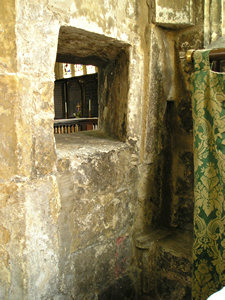 Nearby is the squint, in the wall of the south chapel, a hole in the wall at an angle to allow those in the chapel to see the altar. And behind the altar is this reredos, painted in 1721. 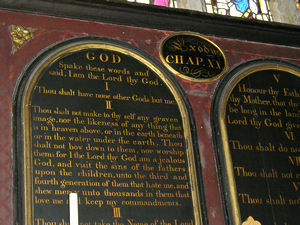 It displays, in gold lettering, the fundamentals of Christian doctrine. Another handwritten sign nearby explains its significance. And notes that it is "what is now termed a ‘Visual Aid’." 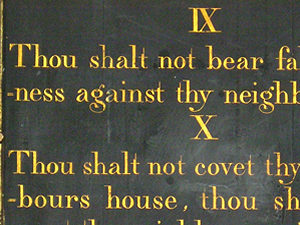 Among the commandments is the one about not coveting your neighbour’s house. There’s a lot of house coveting these days, as so few people can afford to buy one. The stained glass here is much admired. 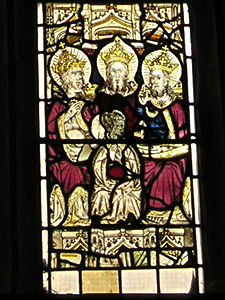 The east window – just a detail of it is shown here (left) – is "a fine example" of late 15th century glass, dating from the 1470s – a rare date for York glass, apparently. 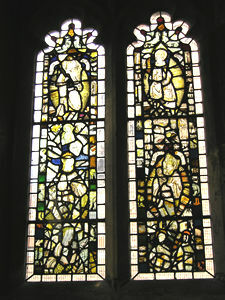 The photo on the right shows another stained glass window of 14th and 15th century fragments. These faded, greenish, brownish hues were particularly pleasing, I thought, with the startling blue in the centre. 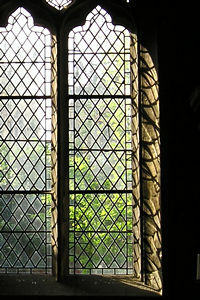 This window (far left) boasts no stained glass, but through its clear glass you can see the greenery of the churchyard, just as beautiful in its own way. 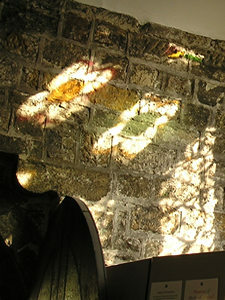 And the light is falling through the west window at this time of the day, and casting coloured patterns on the wall. 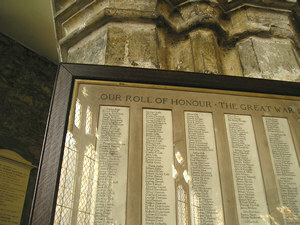 Details from different times – above left, a Roll of Honour from the First World War; above right, an architectural fragment, a waterleaf capital, dating from circa 1180, and probably from the Minster. 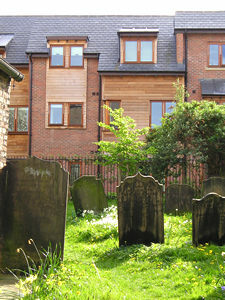 The churchyard is as wonderful as ever, a quiet retreat tucked away behind the shops. 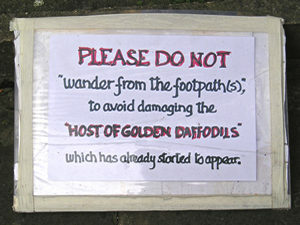 Another sign here advises keeping to the paths, to avoid damage to the "host of golden daffodils". 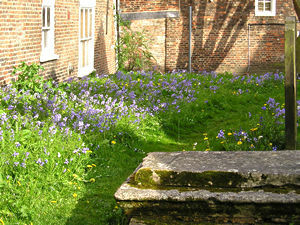 At the time I visited, the daffodils had faded and the bluebells were out. Since I was last here, the view from the churchyard has changed. New buildings thrust themselves forward into view. The photo far left shows how they look from the "back" of the church. Straight on like this they look handsome enough. From the viewpoint of the main gate – as shown above right – they stick out – maybe too intrusively? – into what was a rather nice view of the Minster and Holy Trinity together. 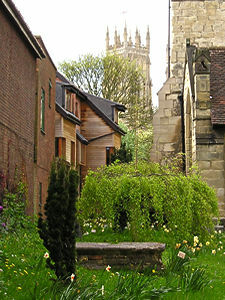 For more photos of the churchyard and exterior of this church see an earlier visit: Holy Trinity, Goodgramgate (York Walks /3, summer 2004). 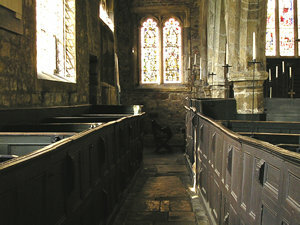 Holy Trinity is one of the many churches cared for by the Churches Conservation Trust. Background information came from – Yorkshire: York and the East Riding (Pevsner Buildings of England), by Nikolaus Pevsner and David Neave, and from York (Bartholomew City Guides) by J Hutchinson and D M Palliser (apparently no longer in print). And also, as mentioned, from the information provided in those very helpful signs in the church itself.